For their latest project, Found Magazine, the collage-like collection of letters, notes and insightful receipts readers have submitted after finding them discarded on the street, went to some of their favorite people for inspiration. 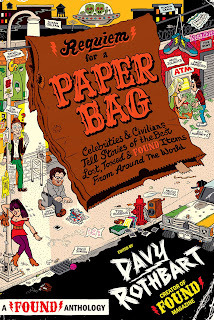 The cartoony cover art depicting all these characters in the midst of finding their items was created by Brooklyn graphic artist Michael Wartella. With Brooklyn such a treasure trove of finds just waiting to be found here, what's something you've found on the borough's streets? Tons of garbage litters the city’s streets, but it takes a true artist to find the hidden gems – the receipts of curious purchases that leave much to the imagination, the love letters that are no longer with their intended paramour. Davy Rothbart and Jason Bitner are masters at finding such items, and since 2001 they have been compiling them, with the help of reader submissions, into a collage-like magazine called Found (Bitner also oversees the more risque Dirty Found). Each year, the material is brought to life, with Davy reading the found materials out loud, and his brother, Peter, playing Flight of the Conchords-esque songs based off of them as well (see Davy on David Letterman here). This month, the Ann Arbor-based duo brings the uproarious live act to Brooklyn, with a show at the Gowanus venue The Bell House on May 6 (and, in case you miss it, a second, Manhattan show on May 8 at the I.C.E. Auditorium). In addition to spending the show reading found items, the two will also pull material from their new book, “Requiem for a Paper Bag,” comprised of personal stories of people and their found items. Davy was inspired to start the book by intriguing letters he would get from readers along with their found items. So he reached out to some of his favorite artists, writers and musicians to submit stories of their own, including Andy Samberg, Miranda July, Seth Rogen, Sarah Vowell, Patton Oswalt, Chuck D., Dave Eggers, Andrew Bird, and David Simon (creator of The Wire), among dozens more. Those who couldn’t think of something themselves chose an item from the book and wrote pieces inspired by that. Also taking inspiration from the Found project is The New York City-based arts education program/sketch comedy group The Story Pirates, which has been creating pieces based off their favorite Found items. They will perform a few of their pieces at The Bell House show. Some favorites that have made their way into Monty Python-esque sketches includes what they call “What I Know About American History,” a verbatim retelling, in a big opening musical number, what a junior high school boy has written down as fact what he knows about American history, such as George Washington chopped down his father’s cherry tree with an ax his dad gave him for his birthday, to information on hot rods. Another item, that Peter also wrote a song about, involves a women on the hunt for the man she met the night of her bachlorette party by leaving notes under the windshield wipers of parked cars. The Story Pirates look at the situation from the point of view from the fiance as his girlfriend breaks the new to him. Those who plan on attending the show are encouraged to bring their own found items, which The Story Pirates might incorporate into their show, or make its way into Found’s live act, magazine or Web site. With 100 to 200 mailed or e-mailed submissions a week of found items, the project succeeds because it’s a community art project. Found Magazine comes to The Bell House (149 7th St.) May 6 at 8 p.m., joined by The Story Pirates as well as The Main Squeeze Orchestra. Tickets are $7. The show will also be at the I.C.E. Auditorium (345 E. 15th St.) in Manhattan on May 8 at 7 p.m. (tickets $10) also with The Story Pirates.